All of our cookies on our website can be gift boxed in our signature kraft box tied with a beautiful green ribbon and finished with a gift tag carrying our famous logo. If you would like us to add a message for you please click the "Contact Us" link in the navigation bar to the left. E-mail us the message that you would like to include. Please include your order number with the e-mail to be sure your message is included in the order. 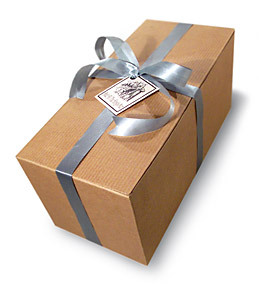 Please Note: Gift wrapping cannot be selected on this page.If you wish to gift box any of our products, simply go to the product page of your choice and select your flavour along with gift wrapping. Other products which may be of interest to you.